I have been waiting (and waiting and waiting!) for the sequel to "Doon", since it was one of my favorite books of 2013. 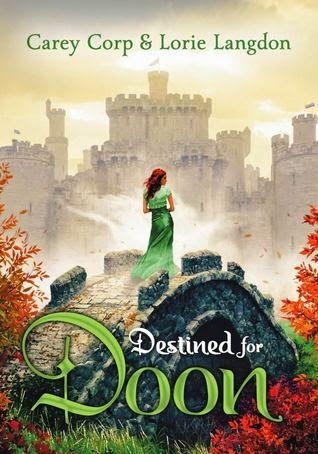 "Destined for Doon" did not disappoint! I absolutely loved it, in fact, as much as I enjoyed Doon, I enjoyed this one much more. In this installment, we get to revisit Veronica and Mackenna, the two leads from the first book, as well as their handsome Scottish suitors, Jamie and Duncan. I really loved Mackenna in the first book and I was thrilled that the sequel focuses on her story, while Veronica takes on a supporting role. Duncan was one of my favorite book boyfriends the first time around, and he is just as fantastic in this book. The story is soooo romantic, I was absolutely swooning on the first few pages. I loved reading about Mackenna and Duncan's journey back to Doon and possibly back to each other. There are darker forces at play in the second book. There is a dark plague taking over Doon that only Mackenna can see. This definitely adds a spooky and creepy element that was not there in the first book. I really liked this additional facet though, it made the book that much more intense. Bottom Line: This sequel was definitely worth the wait! It's rare that a sequel is more fantastic than the original, but this is one of those rare gems! Really good. I loved the first book and can't wait for this one! hearing that it is better than the first has me jumping out of my skin for it. I thought of you the second I saw Doon at BEA a few years ago! OOoh nice! I'm hearing good things about this series lately and sooo can't wait to read it! This is new to me but sounds like a good series. The cover is rather enchanting. Thanks for the giveaway. I haven't read Doon yet, but reading the description of this book makes me want to give it a try! Scotland is so in the news today that I'm feeling the need to read a book like this! My teen LOVED the original and would love this one -- thank you! I have not yet read Doon, but I have heard great things about it, and am really wanting to read them! Thank you for the giveaway! I haven't read this book, but I've added it to my list on GoodReads. Thanks so much for the giveaway!